WESTERVILLE, OH (WCMH) — The Tunnel2Towers Foundation, established in the wake of the 9-11 attacks, will pay off the home mortgage of Westerville Police Officer Eric Joering. Joering was shot and killed in the line of duty last Saturday. The Tunnel2Towers Foundation honors the memory of Stephen Siller, a New York City fireman who strapped on his fire gear and ran through the Brooklyn Battery Tunnel to get to the World Trade Center towers during the Sept 11 attacks. He died saving others. The foundation focuses its resources on extraordinary cases of first responders with young families and who are killed in the line of duty. Joering and his wife Jami have three young daughters. Every year the Tunnel2Towers foundation raises money with a run that re-enacts Stephen Siller’s last run – through the tunnel to get to the towers. After hearing Washington state medical debt stories for an investigative report, Seattle News Station KIRO 7 decided to do something about it. The news station worked with New York-based charity RIP Medical Debt and bought $1 million worth of medical debt owed by viewers in the area for $12,000. 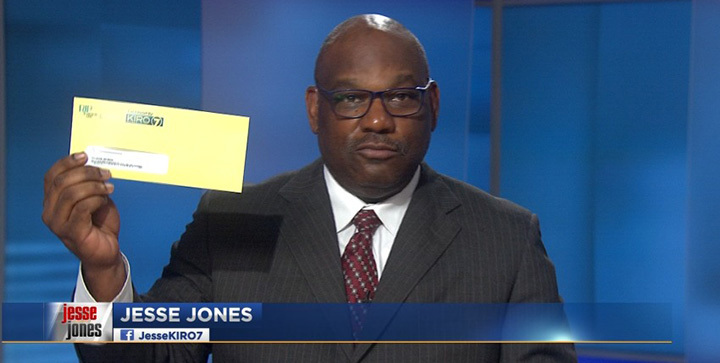 One thousand people will be getting letters in yellow envelopes that have a KIRO 7 sticker on them to let them know their medical debt has been forgiven. 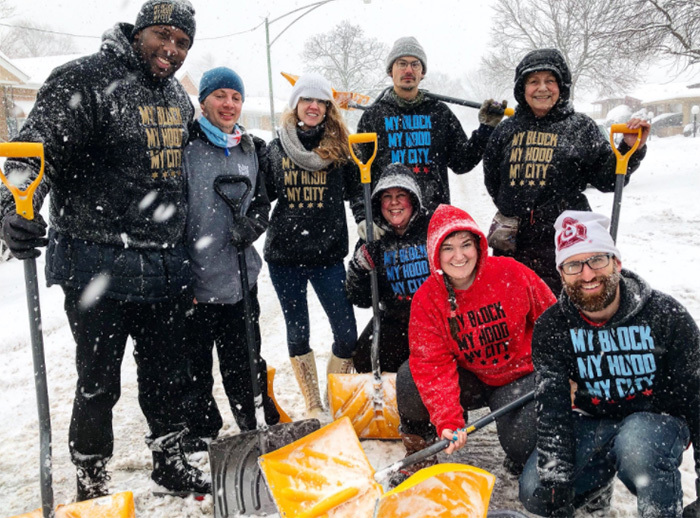 A man in Chicago asked for 10 volunteers to help him shovel snow for the elderly and the response he received will restore your faith in humanity. 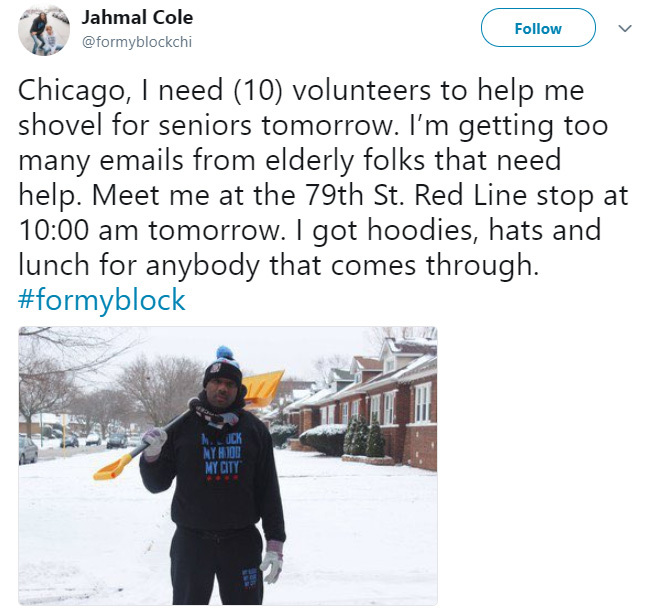 Jahmal Cole, who runs a nonprofit community group called “My Block, My Hood, My City” posted the request on Twitter on February 9. Over 100 volunteers arrived to help shovel snow, Chicago’s WGN 9 reported. Many people who do not live in Chicago made donations to My Block, My Hood, My City, whose mission is to help underprivileged teenagers overcome poverty by taking them on explorations focused on arts, culture, and community service. 120 volunteers shoveled the sidewalks at more than 50 homes, mainly where the elderly live. “I met somebody from Rogers Park, Lakeview, Hegewisch — they say Chicago is segregated, but obviously people care about other people in our city,” Jahmal Cole said. Bridget Kelley, 8, was just hoping for a return to normalcy on her first day back in elementary school after a 15-month absence for cancer treatments and a stem cell transplant. Her classmates and their parents made sure the third-grader’s return on Jan. 2 was anything but normal, thanks to a special greeting the Kelley family will never forget. 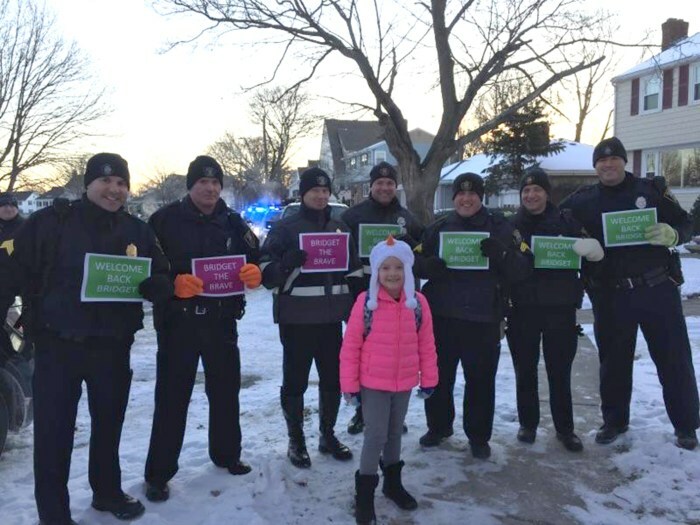 As Bridget walked to Merrymount Elementary School in Quincy, Massachusetts, she was met by hundreds of students, parents, teachers and police officers holding colorful signs welcoming her back to school. “It was almost overwhelming,” Bridget’s mother, Megan Kelley, told TODAY. “She felt so special and so welcomed after such a long and hard road.” “Her classmates wanted to let her know, ‘You were out for 15 months, but we absolutely did not forget about you,” Kristin Healy, a school parent who helped organize the gathering, told TODAY. Bridget was just beginning the second grade when she was diagnosed in September 2016 with acute lymphoblastic leukemia, a type of blood cancer. She spent 88 days in the Boston Children’s hospital undergoing chemotherapy and surgeries. Her condition required a stem cell transplant in March when she didn’t go into remission right away, her mother said. Bridget’s initial diagnosis came after she went to get a swollen tonsil removed, and an MRI revealed it was something much worse. “We were completely blindsided,” Kelley said. “We just thought she was getting her tonsil out. “Bridget’s 3-year-old sister, Shannon, was the donor for her stem cell transplant. She could only have limited contact with people following the surgery because she was on medication suppressing her immune system. Bridget had her own bedroom, a special diet and limited contact with friends that had to take place outside the house. “She had to live in isolation,” Kelley said. “We couldn’t have anybody in the house. She understood that the cancer was serious, but it was almost more devastating that she wasn’t able to go to school or soccer or dance or birthday parties. “While Bridget was out of school, families in the community arranged to regularly bring meals to the Kelleys and raised money for the family and cancer research. Bridget was able to get tutoring during her time in the hospital so she could graduate to third grade and remain with her classmates. “I think they have lots of treasures in heaven,” Martin added, in praise of the mysterious benefactor.Similar acts of generosity have also taken place in other parts of the country, as the countdown to the holiday season continues. Staff at a diner in Scottsdale, Arizona, received a $2,000 tip on a $17 tab over the weekend, while the Shawnee Police Department in Kansas has been handing out $10,000 in cash on behalf of an anonymous donor. Oh, thank you, thank you for this! Definitely needed some “good news”! You have lifted my heart today. God bless you big time! Thank you and you’re welcome. We all need some good news.